A very well made forged flexible lever set, available in three colours, black, red and blue. 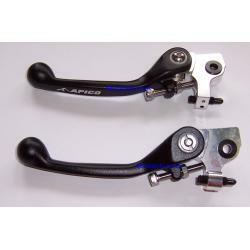 these come as a matched pair for clutch and brake. These will fit both the small and large AJP master cylinders. You can adjust the actuating pin position to suit your application, offset for the large cylinder (most trials bikes) and centre for the small cylinder type. Forged levers are tough anyway, but with these, if you fall awkwardly, the lever will bend forward against a strong spring. Virtually indestructible levers, and look good too.